On Saturday, Aug. 25, from 10 a.m. to 2 p.m., the Champaign County Historical Society will host “Car Show at the Museum” rain or shine. 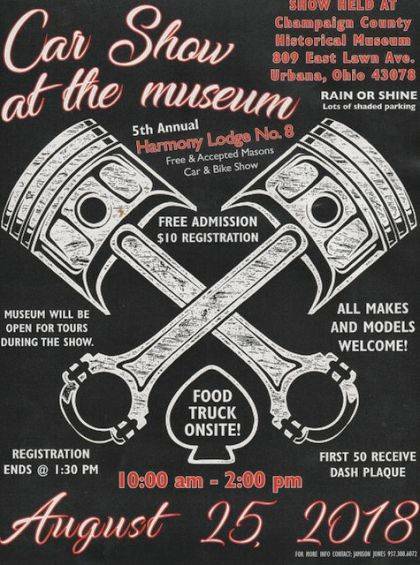 Sponsored by the Free and Accepted Masons and Harmony Lodge 8, the show will be held under the spreading oaks on the museum’s front lawn, 809 East Lawn Ave. Admission is free. All makes and models are welcome. There will be food trucks on site and the museum will be open. The Champaign County Historical Society is an all-volunteer, not-for-profit organization that preserves, protects, archives and displays the artifacts that tell the Champaign County story. The society depends upon donations and dues to provide a free public museum, which is open 10 a.m.-4 p.m. Mondays and Tuesdays and 1-4 p.m. Sundays.